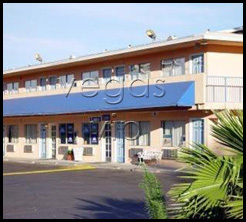 Address: 167 E Tropicana Ave.
Standard room amenities : cable TV, PPV movies, telephone, AC, voice mail, microwave and refrigerator. Hotel amenities : Laundry, maid servise. Just one block from the Strip, the Americas Best Value Inn and Suites has eight two-story buildings with 262 rooms and suites. Also equipped with a 24-hour lobby, voice mail, plus pay-per-view movies and electronic door locks, guests will find they have everything they need. Refrigerators and microwaves are available in the suites for extended stay. Amenities include free HBO, plus a pool and sports court on property and also a pool and whirlpool spa. America’s Best Value Inn and Suites is within walking distance of restaurants.